Bhiwani and Mahendragarh districts of Haryana and Bharatpur in Rajasthan will now be a part of the National Capital Region (NCR). This proposal was approved at the meeting of NCR Planning Board on Monday. This move will lead to major infrastructural development in these areas. The meeting was held under the chairmanship of Urban Development Minister Kamal Nath. "Based on the request of the participating states, the board has approved the inclusion of Bharatpur in Rajasthan, Bhiwani and Mahendragarh in Haryana in NCR. 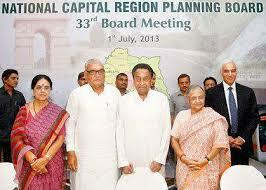 The proposal for including Karnal and Jind districts of Haryana in NCR are also being considered,'' Nath said. Funding from the NCR Planning Board will be available for projects in areas included in NCR. "Loans can be made available at cheaper rates to such areas. This will eventually lead to an increase in real estate prices,'' said a Ministry official. Until now, the NCR included nine districts of Haryana, five districts of UP, Alwar in Rajasthan and the National Capital Territory (NCT).